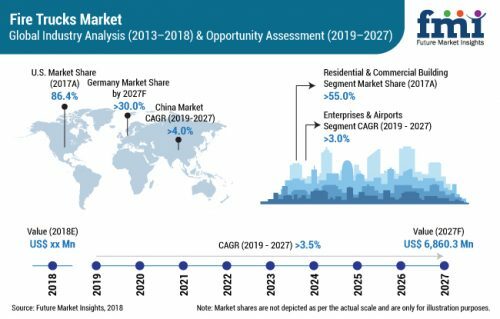 Future Market Insights has announced the addition of the “Fire Trucks Market: Improved Technology and Automation Key Force to Support Production: Global Industry Analysis 2013 - 2018 and Opportunity Assessment 2019 - 2027" report to their offering. Valley Cottage, United States - February 6, 2019 /MarketersMedia/ — Rescue fire trucks are estimated to explore a slew of opportunities in terms of innovation and sales, boosting traction in coming years. With surging industrial safety concerns and frequently evolving safety regulatory guidelines, fire trucks continue to witness significant technological innovation. To cater to stringent norms set by the US NFPA (National Fire Protection Association) and other government affiliated entities, manufacturers of fire trucks are focusing on equipment upgrade – translating into demand growth in the fire trucks market. The global fire trucks market has been witnessing emergence of specialized fire trucks in recent past, which is foreseen to be an important factor contributing to market growth. However, the approximately US$ 5 billion global landscape of fire trucks is projected for a sluggish below 4% yearly growth rate in 2019 and ahead. A new market intelligence on global fire trucks landscape forecasts a passive growth outlook for the market. High initial capital and relatively low penetration rate are prominently posing a challenge to the market growth, as indicated by the report. A senior market research analyst adds further, “Even though the fleets of fire trucks are aging, they are not being replaced by the new ones at a considerable pace. While this is straightaway hampering the sales of new fire trucks, the entire scenario ultimately results in limiting the revenue growth of global fire trucks market. This is foreseen to be the situation in the long run, if the same continues over coming years”. Developing regional markets, experiencing dramatic advancements in construction and infrastructure industries, are compelling various governmental and non-governmental bodies to impose strict regulatory and administrative codes. This, according to the report, will remain the key factor propelling demand for fire trucks across emerging economies, in coming years. More than 55% sale of fire trucks is accounted by adoption for residential and commercial end use applications, followed by that in enterprises and airports. While the rampant expansion of construction industry is cited responsible for catering to the demand for fire trucks in residential and commercial sectors, developed regional markets are presumably driven by consistently progressing interest in adoption of the cutting edge technologies enabled fire mechanical assemblies and equipment. The report thus highlights relatively high rate of fire trucks purchase across economies such as the US, UK, France, and others in North America and Europe. While Europe and North America remains the global manufacturing and operational hubs for key manufacturers of fire trucks, the report projects a strong possibility of developing regions serving significantly in reshaping the entire competitive scenario of fire trucks market. A large number of SMEs in the fire trucks space are rapidly shifting their manufacturing bases to progressing economies - including China, India, Russia, Brazil, and ASEAN countries, to capitalize on the inexpensive labor costs and lucrative opportunities arising in the residential and commercial segments. The report says that over the next few years, Latin American market for fire trucks is likely to witness emergence of Brazil and ROW as production hubs for fire truck manufacturers. The demand for rescue fire trucks is slated to sustain in airports to cater to soaring terminal security demands. Research also points to sustained sales of ARFF (aircraft rescue firefighting) vehicles for rescue operations at airport terminals. With a significant upsurge in air traffic and a considerably increasing number of airlines as a global level, it is more likely that the fire trucks demand at airports would be sustained over coming years. The top seven players in fire trucks marketplace account for more than half of the total market value, as indicated by research. The prominent companies competing in this fairly consolidated landscape are investing in strategic acquisitions and collaborations in an effort to reaffirm their market positioning. Long-term contractual deals for reliable supply of specialized fire trucks are likely to strengthen strategic relationship between market leaders and key distributers. Expanding existing fire trucks portfolio, with maintaining the focus on novel technological innovations, leading manufacturers and suppliers of fire trucks that are actively operating across the global value chain are projected to prioritize fire trucks and equipment upgrade. Although pumpers and tankers contribute majorly to total sales of fire trucks at present, the report indicates growing demand for aerial platform fire trucks and rescue fire trucks – likely to shape competitive manufacturing strategies of key manufacturers in the market. In the backdrop of the rate of natural calamities occurred in recent past, it is more likely that rescue fire trucks would experience growing demand.